If there’s a fine line between stupid and brilliant, Theatrefront’s staging of The Orange Dot under director Vikki Anderson is both stupidly brilliant and brilliantly stupid. It may just be theatre’s brightest colour scheme this month. Polished professionals learn early on in their career that there is certain subject matter not to be discussed in the workplace for the sole purpose of avoiding contentious debate. This includes—but not limited to—suggested behavioural practices for TTC drivers to improve ridership experience, the Toronto Maple Leaf’s inability to attract a 50-goal per year player to its roster, and political messiah Stephen Harper’s miracle working ways advancing social policy across the nation. In short, you don’t do it. It’s just not done. 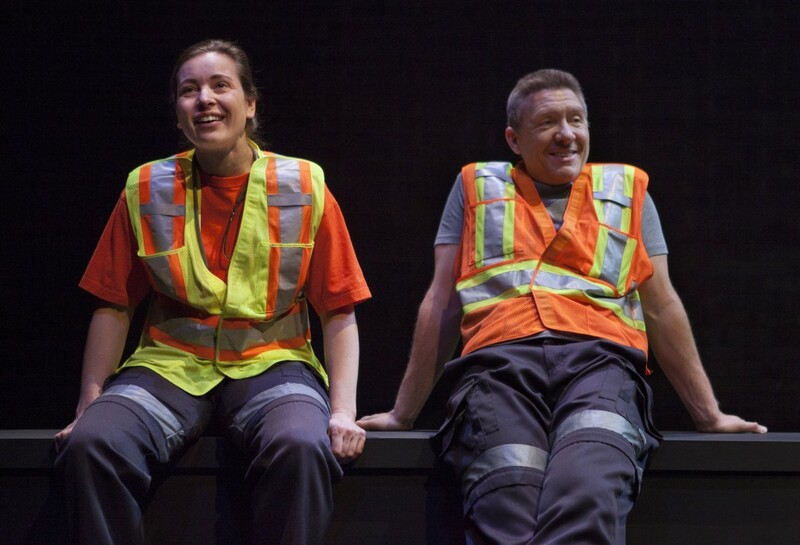 Natalie (Daniela Vlaskalic) and Joe (Shawn Doyle), two rough-around-the-edges city workers that have arrived for a tree cutting assignment, can learn a lot from this. Because on this day a traffic snare means work cannot start on time and a window of opportunity presents itself to talk about everything under the sun for a woman whose mother has recently passed and a man whose hangover might ultimately push him over the edge. Are Canadian museums safe from terrorist attacks? What are the risks of field mice infesting a nearby country house? Is fruit fly research overrated? And is there such a thing as a true female role model in today’s society? Mind-numbingly moot points are challenged and deeper conflict surfaces with the clock slowly winding down for the termite plagued limbs in the background. Playwright Sean Dixon’s superlative silly story trunk is a uniquely Canadian romp for everyone looking for something a wee bit different. Not only is it deep rooted with barking banter reminiscent of both Kevin Smith’s Clerks and Coen Brothers’ The Big Lebowski, his offering branches out with shaded concepts of historical significance. What’s particularly paradoxical about The Orange Dot is that this is not remotely the same speak that can be shared with two Bay Streeters in an office tower. Sure, relevant topics can be creatively tabled, however the point of reference and language would be worlds apart in appeal. Daniela Vlaskalic and Shawn Doyle give off more heat than a 1,000 acre forest fire in this absurdly arousing presentation. As dumb as a stump labourers on a mission to just to make it through the day, the titillating duo may not inspire the next generation of tree huggers but will no doubt cause some difficult decisions for Dora Award jury members this season.